As carers it never ceases to amaze us as, how some animals manage to survive and come in to care. The story of Kessy the Mountain Brushtail Possum I think warrants mention as one of the memorable ones.This little female was found by a tourist from Germany, he was driving through Mullumbimby on a cold winter evening, when he noticed this tiny possum walking along the road, as the car lights picked her up he stopped to investigate what it was. 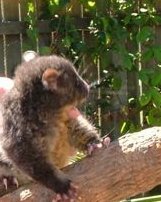 Not knowing anything about Australian native animals, he knocked on the door of the first house, and the occupants were able to tell him that it was a tiny possum.Her fur had not yet grown, and her eyes were still closed, how she had not gone too cold is a wonder. As to what happened to her mother we have no idea, she was never found. When she was brought in to care she was in fairly good condition although cold, she was immediately given warmth and nutrient and have since thrived in Lee's care. Possum joey's this age would normally still be in Mums pouch, and do not normally leave the pouch even after Mum has passed away. Another little Mountain brushtail arrived 10 days later, this time a lady from Mullumbimby driving to work noticed a dead possum on the side of the road. Driving back home that evening she again noticed the possum, so stopped to check just in case. She found a very dehydrated and frightened little possum joey. That is how "Kassie" the second little possum came in to care. The third possum joe, this time from Tyagarah, was found by a gentleman when he discovered a dead possum close to his driveway, which is situated by the highway, he checked the pouch, and that is how "Fang" came in to care 9 days later. They were all cared for by Lee, and when they were furred and able to regulate their own temperature they were introduced. It did not take long for the 3 of them to find each others pouches, and before long they were all in one pouch most the time.Mountain Brushtail's are solitary animals, but as very young and juveniles they would in the wild spend all their time with Mum, how sad for them to be growing up alone. So as carers we try if at all possible to unite them with others of their own kind, and same age. Kessy was lucky, she had another female and a male as companion.After about 7 weeks they needed a bigger space to move about and be outside in safety, and that meant a large aviary, and a possum box big enough to accommodate 3 juveniles.They are seen here as they grow. 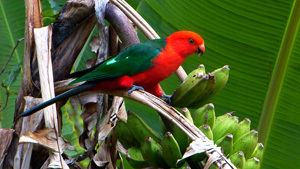 They are still in care and will spend some time yet in the aviary learning how to find food, and how to be the acrobats that they will need to be when released. Kessie, Kassie and Fang have been released, they are still returning to their aviary in the bush every few days for reassurance, but slowly venturing further each night. 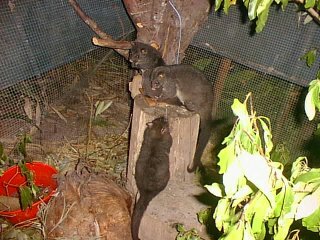 I guess it would be hard finding a hollow log for 3 Mountain Brushtail's to fit in, but I am sure they will eventually find their own way. 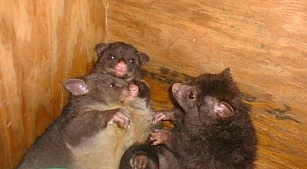 This possum specie stay with their mother for a very long time, in the case of orphans, they may take longer to feel secure in the wild, and as carers we have to make sure they have plenty of time to explore, and still have access to security, as they become adults and eventually leave for good.